Biostatisticians—analysts of biological data—are charged with finding answers to some of the world's most pressing health questions: how safe or effective are drugs hitting the market today? What causes autism? What are the risk factors for cardiovascular disease? Are those risk factors different for men and women or different ethnic groups? 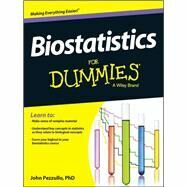 Biostatistics For Dummies examines these and other questions associated with the study of biostatistics.